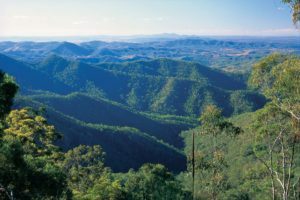 When I was 12 years old my parents took us on a country adventure to visit some friends in Biloela, Theodore and Moura. We stayed on a property where we rode horses, fed farm animals, visited historical sites and experienced an authentic country life. So when my husband and I had the chance to include the Sandstone Wonders on our itinerary, I jumped at the opportunity. And as we pulled into Biloela and smelt the fresh country air, my fond childhood memories came flooding back. What I’ve come to realise is that tourism in country towns is different to major cities. The best places are not necessarily handed to you on a silver platter – you often have to dig a little to find the gems. We found that visitor information centres, other travellers and local pubs are a wealth of knowledge for great things to see and do, but the biggest surprise was that places signed “by appointment only, please call …” ended up being the BEST experiences we had. The Queensland Heritage Park is a very interesting place. 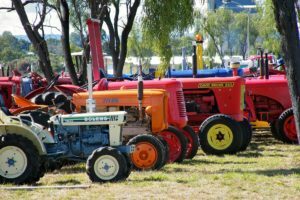 There is a huge collection of indoor and outdoor heritage machinery, interactive displays, photographs, family histories and a theatre room that showcases the region’s rich heritage in agriculture, mining and the pioneering spirit of Australia. The park provides visitor information, a café, training rooms and a newly opened 24-48 hour camp ground with water and power available. We met some lovely grey nomads and families who told us about some of their great experiences in the region and what we could see and do. My second great thing to do was a recommendation from a Grey Nomad who said we had to try the damper and billy tea at Golden Park Retreat, Peaceful Lane, Goovigen. 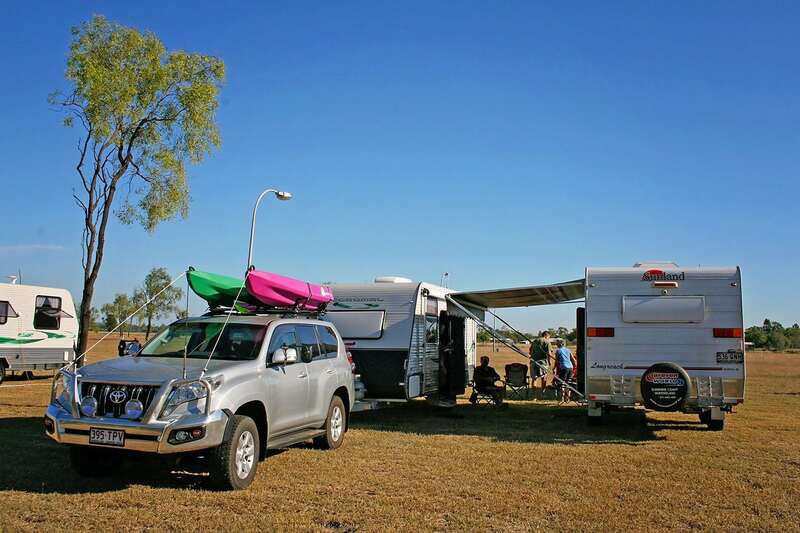 It was one of those “by appointment only, call Maree on 0438 106 391” and while we were a little hesitant at first to call, it was certainly one of our best experiences. We had a tour of the beautiful Japanese, Balinese and Australian inspired gardens, freshly made damper and authentic billy tea. We viewed their antique tractor and household machinery display and fed pigs, hens and horses. We came home with some super fresh veggies that we dug up from their thriving veggie patch and Maree & Robert were warm and inviting hosts. 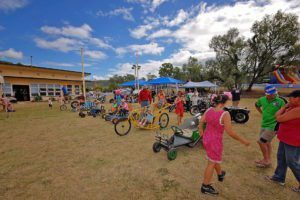 We had a great time in the town of Baralaba and were fortunate enough to be there on the annual Show, Rodeo and Camp Draft weekend. 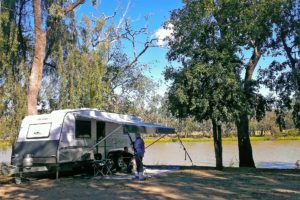 We were told that the best place to stay was the Neville-Hewitt Weir, and while it was a little hard to find at first we were easily pointed in the right direction by the local convenience shop. The weir was a water-front free camp (donations gratefully accepted) that had a shower and toilet facility plus a tap with drinking water to top up your supplies. There was a swing for the kids and it’s a two minute drive from the township. 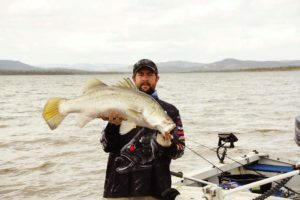 We were told by the Marine Authorities that you could fish in the dam but to grab a copy of their free information booklet (at BCF) or look at their website to ensure you don’t breach the rules and receive a fine. 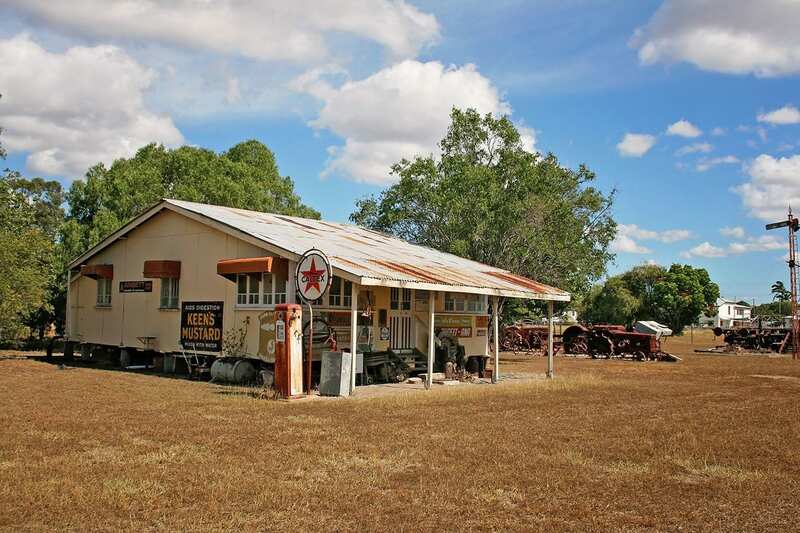 There was an amazing Historical Village in Baralaba town which was almost 100 years old and had heritage machinery and lots of historical items to look at. Viewing of this village was also by appointment and we had an interesting time looking around. I’ve always been a big fan of country shows… the beautiful horses and livestock and the friendly wholesome fun atmosphere, and the Baralaba show did not disappoint. Our 3 year old daughter Chloe met her first country friend who took her by the hand and showed her around. They rode on the fire truck, choo choo train and ran around having the time of their life. Being a major beef-producing region of Queensland, the fresh sizzling steak burgers at the show were mouth-watering to say the least. The Rodeo was my first and I can certainly say that they breed tough people in the Banana Shire. The Camp Draft was also a new event to me and really symbolised the region’s rich cattle ranching history and showcased what working on properties was all about. 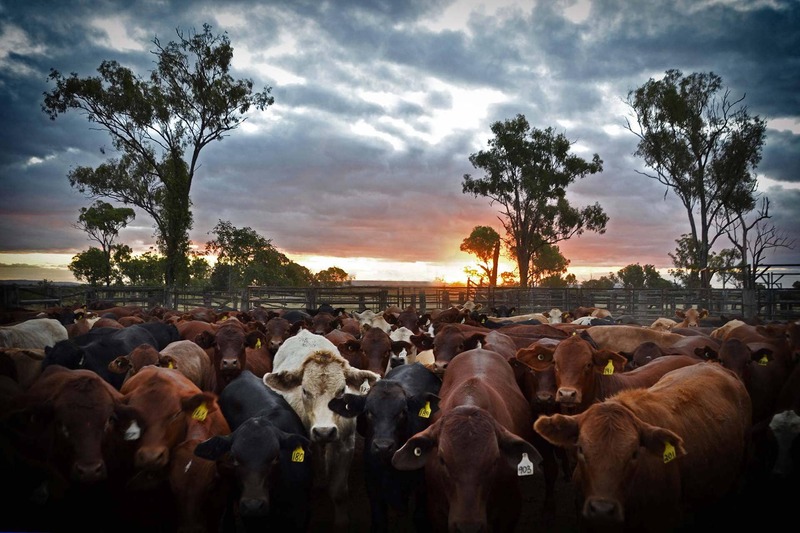 Another “by appointment only” experience we were fortunate enough to have was visiting one of Theodore’s largest cattle and stud properties at Gyranda. The knowledgeable and passionate Burnett and Louise Joyce showed us around their beautiful property and answered my hundreds of questions. We learned so much about agriculture and everyday life as a station owner and came away feeling very enriched by the whole experience. 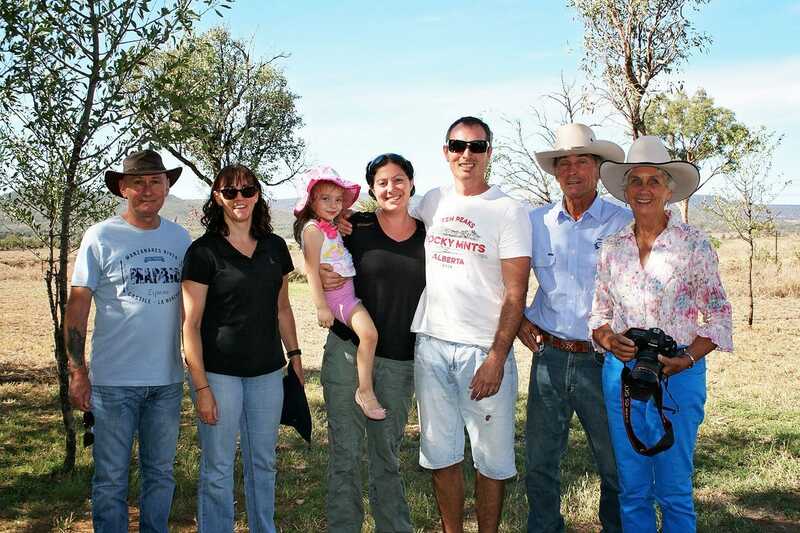 A farm stay or cattle station tour is something we would certainly recommend that you put on your “must-do list” and while this tour is not usually available to the public, there are similar experiences available by contacting the visitor information centre or doing a google search. We then took a drive up to Isla Gorge look-out which had a stunning view of the mountain ranges and provided an exhilarating cliff-top free camp. Cracow was a town that I didn’t know much about and almost considered “giving it a miss” but oh my goodness, when we walked into the Cracow pub we were so glad we made the effort. Just 30 minutes from Theodore, Cracow is famous for being one of the last Gold Rush towns in Australia. In 1931, the Golden Plateau mine was established and it operated continuously until 1976. It was hard to believe that all of the abandoned buildings that remain untouched were once alive with 3000 people, five cafes, barber shop, billiard salon, two butchers, a picture theatre and soft drink factory. The closure of the gold mine led to Cracow becoming a ghost town with many deserted houses and shops. You can still have a beer at one of the remaining buildings, the “Cracow Pub” which attracts lots of tourists due to its unusual array of artefacts on the ceilings and walls, and is owned by Fred Brophy. Fred and his famous Boxing Troupe toured the countryside for years, in fact my husband Pedr remembers attending one of Fred’s Boxing Tents in Mount Isa many years ago. There is also the Cracow Mining Heritage Centre which supplies a few powered camping sites free of charge with use of toilet and shower facilities. The centre also has lots of interesting photos and facts about Cracow’s past and you can watch a 10 minute movie about the history of the township. You can also stand on a set of scales and see your weight in gold! In 2004, Newcrest Mining re-established gold mining in Cracow, however while it’s operation is successful it does not appear to have re-ignited the town to it’s former glory. I am told that you can do a gold mining tour of the Newcrest Mine upon request. While we had so many more amazing experiences on our tour of the Banana shire, these are my top 5 that I would recommend if you are looking for a raw, authentic country experience!